The Asteria is where the love affair with OD Guitars began. Every now and then there is that rare occasion when you see a guitar which creates an overwhelming sense of desire. That happened to me when first caught site of the Asteria from OD Guitars. It has been a while since a guitar has created such a feeling but the Asteria is such a thing of beauty that I defy you to look at it and not want to pick it up and play it. 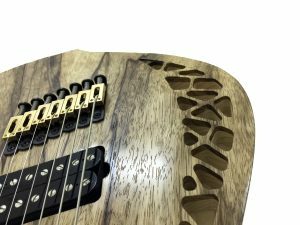 OD Guitars, named after the founder Omer Deutsch, are an Israel based company whose desire is to use the mathematics of nature to create their guitars. Deutsch is an industrial designer by background but is also a guitar player. Combining his background in industrial design and his love of Progressive Metal music Deutsch seeks to create guitars with an organic beauty. However, they are not just things of beauty they are also instruments that can handle whatever musical hyperbole you care to throw at them. The nautilus chamber design is claimed to affect the tone of the guitar. Whether it does or not it can’t be denied that it is a thing of beauty. As a child Deutsch was fascinated by the mathematics of nature such as the Golden Ratio, Fractal patterns and sacred geometry. This early fascination has defined his later life in industrial design. It might be difficult to see how things such as the Golden Ratio can be used in guitar design but Deutsch has routed a nautilus chamber design into the body of the Asteria. This chamber like design is claimed to change the tone of the guitar. By subtly changing the design it is suggested that they can control the bass and treble of the guitar. Whether this is true is open to discussion but forget the functional reasons for the nautilus chamber the aesthetic is amazing, so I am sold. 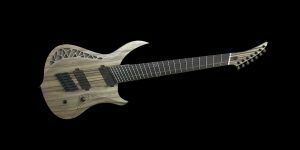 OD Guitars currently have four guitars in their range the Asteria, Rhea, Venus and Cytherea and all start in seven string versions. They are also incredibly high spec guitars, if you have a few thousand quid to spare then one can be yours. The Asteria for example has a natural finish ash body. The set neck is maple with an ebony fingerboard and has 24 jumbo frets. The humbucking pickups are from Bare Knuckle Pickups. The attention to detail and finish on an OD Guitar can not be faulted. These are a labour of love and the end result looks and sounds fantastic. You can see an OD Guitar in action in the video below, which also provides a glimpse into the OD workshop. To find out more about the guitars that OD create then you should check out their website.